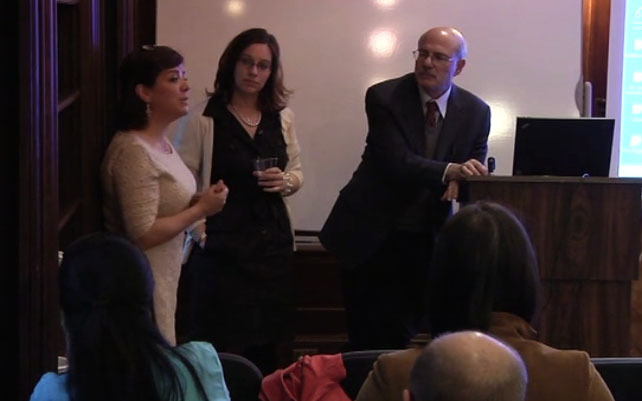 Ackerman Institute for the Family hosted its annual Carl Kempner Memorial Lecture on the evening of May 2, 2012. This year’s talk highlighted the work of the Family Focused High Risk Diabetes Intervention Project with an in-depth discussion of the project by Harold Starkman, MD, Gloria Lopez-Henriquez, LCSW, and Nicole Pilek, LCSW. Established at Goryeb Children’s Hospital in New Jersey in 2007 to better understand the challenges and strengths of high-risk diabetes adolescents, their families and health care providers, the project highlights the significant number of teens who have chronically elevated blood sugars, and are at significant risk for hospitalizations, complications and shortened life spans. The dilemmas of these adolescents and their families often elude and frustrate their health care teams, leading to escalating cycles of negative interactions. This presentation described the project’s findings, including the need to create improved collaborative relationships among teens, their families and medical and mental health practitioners. Harold Starkman, MD, a pediatric endocrinologist at Goryeb Children’s Hospital, talked about the importance of the family structure in treating high-risk teens, while family therapists Gloria Lopez-Henriquez, LCSW, and Nicole Pilek, LCSW, discussed how this family structure influences teens’ response to treatment. The Carl Kempner Memorial Lecture was named in honor of Carl Loeb Kempner, late husband of Doris Kempner, an Ackerman Board member. The Kempners’ life-long commitment to education and social services and the support of the Armand G. Erpf Fund, established the Carl Kempner Memorial Lecture to enhance knowledge in the developing of clinical intervention and in training therapists working with families coping with major health issues.